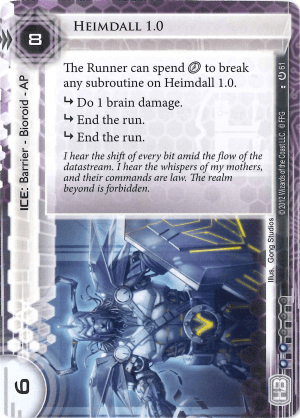 The Runner can spend click to break any subroutine on Heimdall 1.0. I hear the shift of every bit amid the flow of the datastream. I hear the whispers of my mothers, and their commands are law. The realm beyond is forbidden. One of the big boys of the Bioroid series, Heimdall 1.0 is a serious threat. With three subroutines and six strength he is also very expensive to break. At seven credits a pop for Corroder or two power counters for Cerberus "Lady" H1 or D4v1d, this barrier can put a serious tax on the runner who has to break it time and time again. Yet, it is a Bioroid, and the break for a click aspect of all Bioroids makes it a bit more porous. The great thing about Heimdall is his three subroutines. A runner spending an entire turn just to break through one piece of ice (one click for the run, three for the subroutines) is quite nice. Add to that the turn you rez him can often see the runner making the tough choice to bounce by paying the click for the brain damage, or taking the brain damage and still getting through, and he is a serious threat. Eight credits used to be a lot harder to manage, truthfully told, but money has become more and more easily to both sides. If there is any sort of power creep in Netrunner, it is economy becoming more prevalent. That and his status as AP can make a sudden Deus X a big threat to a scoring window. Heimdall never really had a spotlight like some pieces of ICE, but he is still a very respectable barrier. With barriers starting to make a come back, he certainly can see some lime light again.